It would take an ordinary person more than two and a half years to read the entire US Code of Federal Regulations (CFR), which contained more than 104 million words in 2016. The sheer size of the CFR poses a problem not just for the individuals and businesses that want to stay in compliance with the law but also for anyone interested in understanding the consequences of this massive system of rules. States also have sizable regulatory codes, which add an additional layer to the large body of federal regulation. A prime example is the online version of the 2018 Indiana Administrative Code (IAC). Researchers at the Mercatus Center at George Mason University developed State RegData, a platform for analyzing and quantifying state regulatory text. State RegData captures information in minutes that would take hours, weeks, or even years to obtain by reading and counting. For example, the tool allows researchers to identify the industries that state regulation targets most by connecting text relevant to those industries with restrictive word counts. Referred to as regulatory restrictions, the words and phrases shall, must, may not, prohibited, and required can signify legal constraints and obligations. As shown in figure 1, the three industries with the highest estimates of industry-relevant restrictions in the 2018 IAC are animal production and aquaculture, ambulatory healthcare services, and utilities. State RegData also reveals that the 2018 IAC contains 91,988 restrictions and 8.1 million words. It would take an individual about 451 hours—or more than 11 weeks—to read the entire IAC. That’s assuming the reader spends 40 hours per week reading and reads at a rate of 300 words per minute. By comparison, there are more than 1.08 million additional restrictions in the federal code. Individuals and businesses in Indiana must navigate these different layers of restrictions to remain in compliance. The titles of the IAC are organized by state agency. Figure 2 shows that the title of the IAC associated with the Indiana State Department of Health contains more than 9,400 restrictions. By this measure, this is the biggest regulator in Indiana. Coming in second is the Water Pollution Control Division, with more than 7,000 restrictions. The Indiana General Assembly’s website includes archived versions of the IAC from previous years. These data allow for tracking the level of state regulation across time. 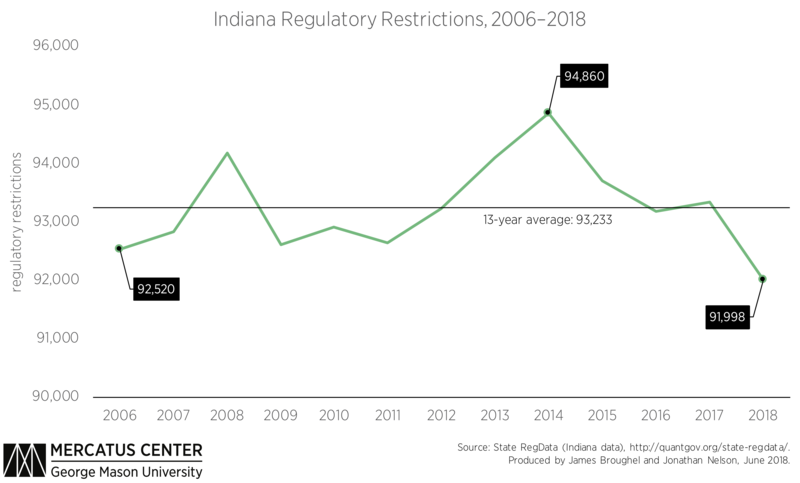 For example, figure 3 shows that the level of state regulation remained fairly constant from 2006 to 2018. The number of restrictions has actually fallen somewhat from its peak of 94,860 in 2014. For comparison, the number of restrictions in 2006 was 92,520 and the average number of restrictions across the 13-year period was 93,233. Federal regulation tends to attract the most headlines, but it is important to remember that the more than 104 million words and 1.08 million restrictions in the federal code significantly understate the true scope of regulation in the United States. 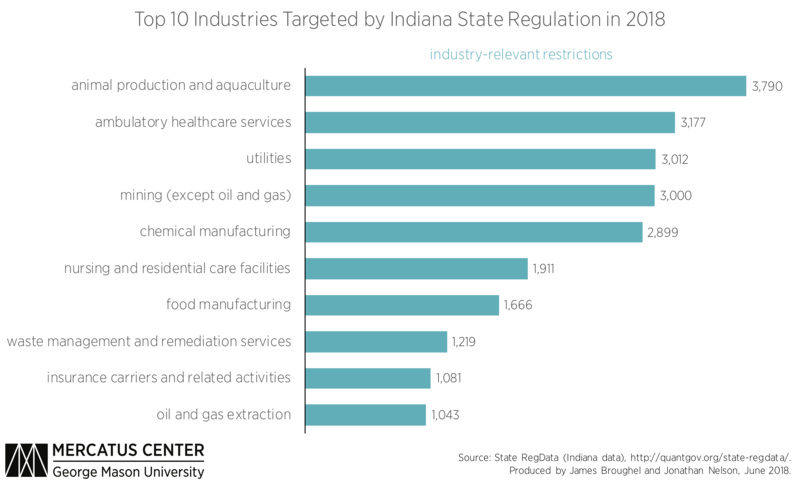 States like Indiana write millions of additional words of regulation and tens of thousands of additional restrictions. State-level requirements carry the force of law to restrict individuals and businesses just as federal ones do. Researchers are only beginning to understand the consequences of the massive and growing federal regulatory system on economic growth and well-being in the United States. Meanwhile, the effects of state regulation remain largely unknown. 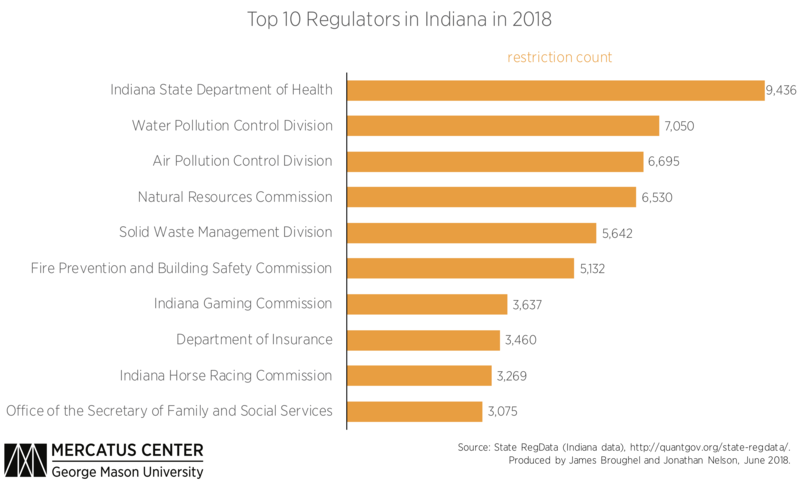 If this snapshot of Indiana regulation in 2018 is a good indicator, then the states are also active regulators, suggesting that the full impact of regulation on society is far greater than that of federal regulation alone.